Art seems to translate very well onto the Internet. Nowadays, many galleries, dealers and collections have ‘virtual galleries’. In today’s cyber world, it makes sense for artists to direct some or all of their sales activities into e-commerce. E-commerce transcends many restrictions that a ‘real’ art gallery or studio creates. The market for your work will be much wider. People who would have been prohibited from viewing your art by location and distance now have the opportunity to do so. You may find new buyers who would be unable to visit a gallery in person because of time, disability or practicality issues such as young children. A lot of buyers prefer to view art in the privacy of their homes. They feel there will be less pressure and more time to browse through or research prospective purchases. The physical distance also makes them feel that they can view art without any implied commitment to buying. Some artists use e-commerce as their sole means of trading or an additional vehicle. There is very little outlay as there are no costs for premises, decorative costs or charges for heating and lighting. E-commerce offers the buyers the chance to search for purchases using very specific criteria. So, if you have marketed your art correctly, the viewers will be more likely to make purchases. Another wonderful advantage to e-commerce is that the emphasis is on the buyer rather than the seller. Once the ‘virtual gallery’ is set up and managed, the buyer will take all the action. They will search, view, enquire and buy. This frees up a lot of time for the artist and productivity should benefit. Finally, the artist can offer his art at more affordable prices as presentation costs will be so much less. 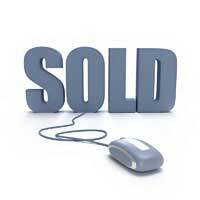 Online auction sites present ideal sales opportunities. It is simple for the artist to promote their work, set a reserve and suitable sales period. The artist can watch their work achieve its highest possible price or true value. There are little or no risks attached, only the potential for financial gain. Successful auctions often require a small amount of trial and error to find optimum prices, attractive keywords in the listing and care to avoid spelling mistakes. Online shops are a useful function of many auction websites. You pay the site owners a subscription to set up your shop. You will then choose a relevant name, list your items and manage the virtual shop with a fabulous array of marketing and sales tools. The online gallery is a similar concept to the online shop. A set-up fee and monthly subscription is paid to the site owners in return for a homepage and the ability to create online portfolios, a ‘shopping cart’ for your buyers and online payment facilities. Another good option is to set up your own website. This is the e-commerce equivalent of direct sales. The process begins when an artist purchases a domain name. This is a snippet of the worldwide web for their personal use, with a unique name and address. Avoid any offers of a free website. These are glorified vehicles for advertising and your precious work will be sullied by annoying and repetitive adverts. A lot of buyers will be put off and lost forever. It’s a good investment to employ the services of a professional web designer. They will be able to give the website a consistent and professional appearance and advise the best ways to take advantage of keywords and merchandising tools. There is no doubt that to keep up with the market, artists need to look to the world of e-commerce. There are lots of different options available and even buying into the technological revolution in a small way can be highly beneficial.